Create as many words as possible with limited letters. Is there a better alternative to Super TextTwist? Is Super TextTwist really the best app in Puzzle category? Will Super TextTwist work good on macOS 10.13.4? 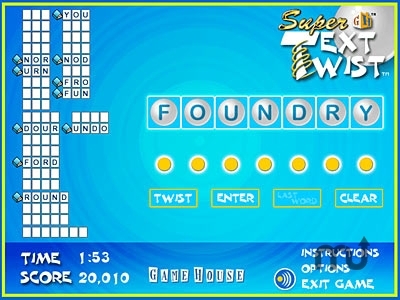 Super TextTwist is a letter and word game. Use all of the letters given to you to make a word and you'll move on to the next round. If you get stuck, just click on Twist for a hint. Don't worry, we've already thought of all the words. You just have to tell us what they are. Super TextTwist needs a rating. Be the first to rate this app and get the discussion started!